Panzer VOR! 2 German Armor at War Book 1939-45 Discounts Apply ! CON7056 - Panzer VOR! 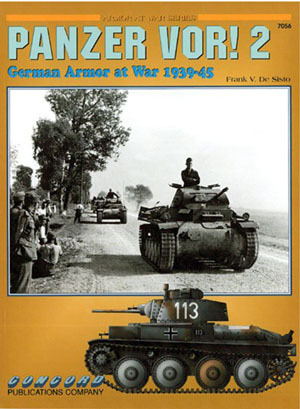 2 - German Armor at War Book 1939-45. The definitive subject of this book is German Panzers of WWII, as suggested by the title. Therefore, from cover to cover, readers are treated to a wide assortment of German armored vehicles. There is everything from armored cars and half-tracks, through the lighter early war Panzer, right up to the 'heavies', the colossal armored tanks and tank hunters so beloved by Hitler. There is even the odd photo of captured tanks pressed into German service. All the theaters of operation are present - Northwest Europe, North Africa, the Mediterranean/Italy, and the Eastern Front. The dates also cover the whole gamut, from the pre-war years through to the war's conclusion. The book's purpose is to provide a survey of Panzerdivisions, and in this it succeeds admirably. Photos have been selected to give coverage that is as wide as possible, meaning all types of vehicles have found their way between the covers. Of course, this ensures that there will be something there to please every reader. To give an idea of the color schemes employed, a set of sixteen color plates by Laurent Lecocq is the icing on the cake. Of further special note are the carefully researched captions that provide a wealth of information. The captions give details about particular vehicles, about the divisions and units operating the vehicles, and also some insightful comments on tactical procedures too. For those wishing to expand their library on German armored vehicles or looking for photographs that are chock-a-block with inspiration, then this volume won't disappoint. Features: 72 pages, 173 b/w photos and 16 color plates.